A race just starting – there’s no way they’ll be this clean by time they reach the finish line. You’ve probably heard that the Japanese are a reserved and shy people who are always very serious and worried about suffering a loss of face. Well, anyone who believes any of that has obviously never been to the Kashima Gatalympics – surely the world’s whackiest sporting event. These girls have just taken part, and they don’t seem to mind being caked in mud. Kashima is a small city on the western island of Kyushu that wanted to do something special to put itself on the map. 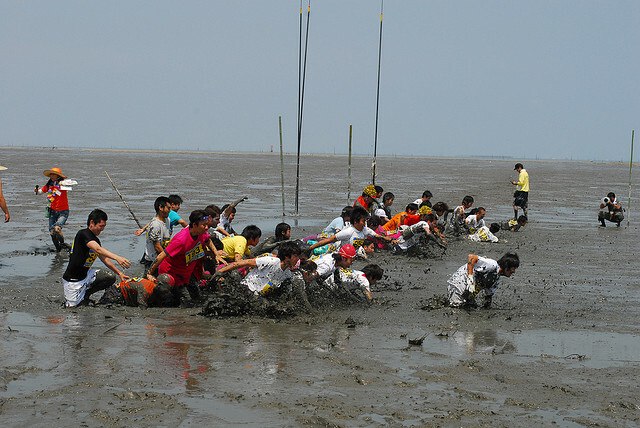 The solution was to organize an annual sporting event, but to liven things up a bit, have it take place on the huge mudflats that stretch along the city’s shoreline rather than on dry land. The obstacle course. Not many contestants make it through without falling in the mud at some point. Yes, there really is a human being under all that mud. 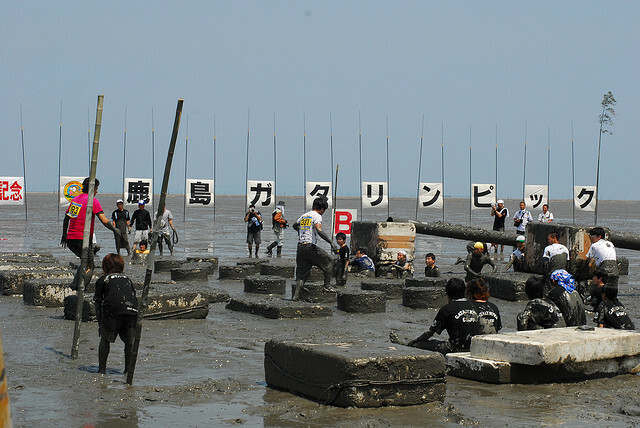 – which is absolutely guaranteed to result in an all-over mud bath for all the competitors. The spirit of the Gatalympics is all about throwing away your inhibitions, having fun, and not worrying about making a fool of yourself. In fact, this is probably about the only chance you’ll get to frolic about in mud without the risk of suffering social ostracism. 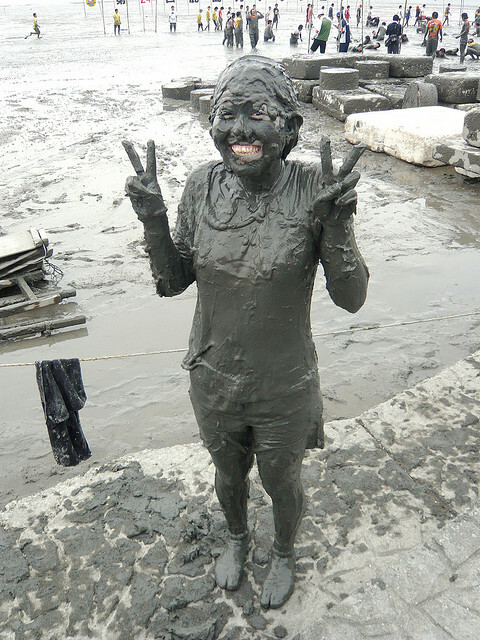 Virtually every contestant ends up plastered in mud from head to toe. Even if they manage to keep their faces clean, someone’s usually kind enough to smear a bit of mud on afterwards. One of the highlights is the women’s sumo – ten women stand on a Styrofoam float, and the last one to remain on the float is the winner. After a few seconds of merciless pushing and shoving, nine women end up in the mud and one emerges as the victor. I think both the competitors and the spectators have a lot more fun with this version than with regular sumo. I think these two are enjoying themselves. Photo courtesy of Skyeslee. 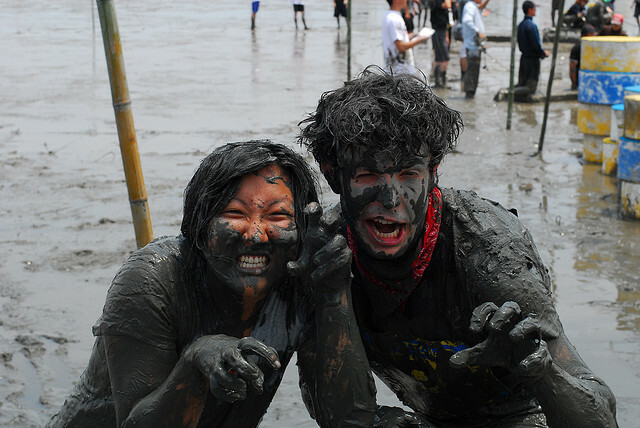 Even if you don’t win anything there’s a kind of consolation prize – a free mud bath. 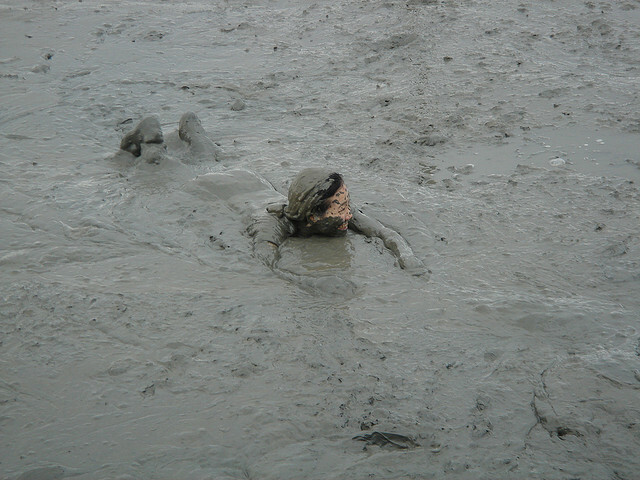 No, really I mean this – floating in mud is something everyone should experience at least once in their life. It feels really weird, not at all like bathing in water, but for most people it’s a really pleasant sensation. Fire hoses are on hand to help everyone get cleaned up at the end of it all, so there’s no need to take the mud home with you afterwards. If you don’t get muddy enough during the competitions, you can always go for a swim afterwards. The Gatalympics have taken place every year since 1985, and are usually held at the end of May. In the first Gatalympics, 300 athletes competed in six events, but this has now grown to 2,000 athletes and twelve events. It also attracts around 35,000 spectators (more than the whole population of Kashima), plus who knows how many more watching on TV. To find out the exact date of the next Gatalympics, contact the organizers on 0954 63 3312 (phone) or at gatalym@vip.saganet.ne.jp, or check out the official Gatalympic website.